Bonjour! Today, I am here to share with you what I believe to be the best-kept classroom decor secret in elementary. So, we all have posters and référentiels on display in our classrooms, right? 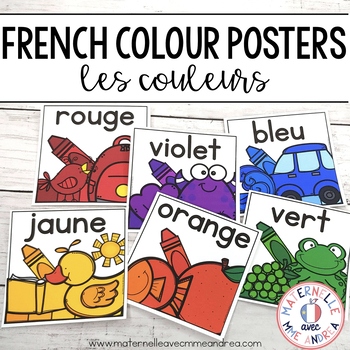 We use them for evvvvverything in maternelle - colours, letters, numbers, sight words, routines and procedures, vocabulary, reading strategies, writing strategies, etc. etc! 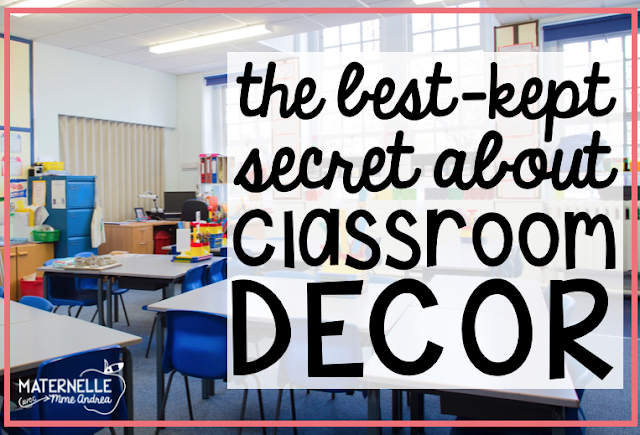 In just about every classroom, you can find store-bought posters, teacher-made posters, and student-made posters (yes - I believe there is a place for all three types). We know that posters and référentiels are valuable - essential, even! BUT... we all have one little problem (or, at least we all do at my school). How many of you have strict fire marshals who don't allow more than 20% of the walls to be covered (and 20% of the walls are pretty much already covered by bulletin boards, white boards, and coat hooks)? Plus, I love using my big white board as a word wall. So, I am always scrambling for space to display my référentiels and the posters that we create together. 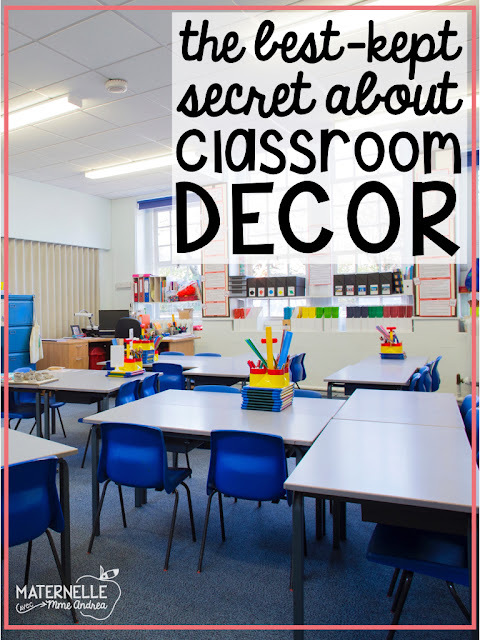 Today, I am going to share with you one little change I have made in my classroom that has resulted in a few extra inches of space all around (and those inches do make a difference!). As I said above, saving space is often the name of the game. And these babies do it! In my experience, you can fit all of the info that you need on a square poster just as well as on a rectangular poster. And, less wasted white space! Those extra inches can mean a whole other row of words on my word wall. Definitely the least important reason, but hey - we all like things that look nice. And square posters look nice! It doesn't make you a bad teacher if you like pretty things in your classroom, as long as having pretty things isn't more important to you than your students' learning (and as long as it doesn't get in the way of that). I mean, I am not going to spend hours decorating my room before school starts each summer instead of making sure I have amazing lessons planned for my students, but if I can display something that saves space, is quick, easy, and helps my students learn, and looks great? Let's be honest - circle posters also save space and they look great. But, they are terrible to cut out!! Sometimes it's worth it (I did have circle alphabet posters up until last year, and my visual schedule is circles), but let me tell you - squares are waaaaayyy way easier and faster to snip. For teacher-made posters, all you have to do is print, laminate, and cut using a paper cutter - all straight lines! For square student-made posters and/or posters we make together, I just chop a strip off the end before I hand them out, so they are already square before we get to work. If we are keeping them on display all year, I may laminate them, but I don't always. So, where can you find square posters? Well, unfortunately the square poster movement hasn't caught on with everyone yet (but we are going to change that, right?! 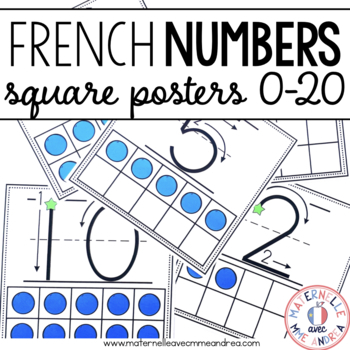 ), so you will have a harder time finding square posters vs. rectangular posters. 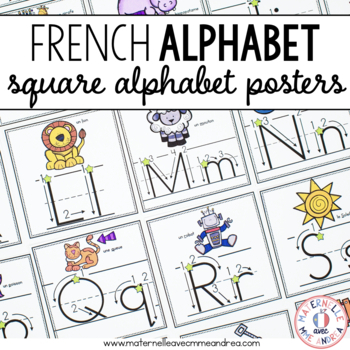 PS - Are you a member of my FREE French Resource Library yet?? There are actually some FREE square posters in there! If not, just enter your name & email below and hit the button. I'll send you the exclusive password and instructions for getting your hands on every freebie I have ever made - and will ever make!